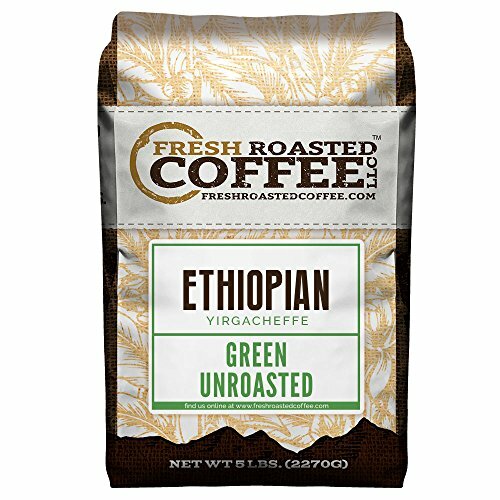 Kochere is a small area within the well-known Yirgacheffe coffee-growing region of Ethiopia. Located in the SNNPR (Southern Nations, Nationalities, and Peoples' Region) of southern Ethiopia, Kochere is just south of the town of Yirgacheffe and is 250 miles southwest of Addis Ababa. The area contains washing stations where local farmers can bring their coffee for processing after it is harvested. The iron-rich acidic soil and high altitude of the region are ideal for growing specialty coffee and the Kochere district is known for producing some of the most lively Yirgacheffe coffees in the region. The Kochere Yirgacheffe is noted for its distinctive floral notes. Home Roasting. We do not recommend consuming raw coffee beans. 100% UNROASTED Arabica coffee beans, no additives, artificial flavors or preservatives. Perfect for at-home coffee roasters. High-quality raw unroasted coffee beans. Custom roast the coffee to fit your own unique tastes. Manufacturer: Fresh Roasted Coffee LLC. Publisher: Fresh Roasted Coffee LLC. Studio: Fresh Roasted Coffee LLC.